We thank you for your friendship, your kindness, your generousity and your patience, of course. Please remember, you always meet twice in life - this is the beginning, not the end! After having finished the work we agreed on in Teterow we are excited about seeing everyone again in Marlenheim. Our last project meeting is hosted by the French local body, Conseil Départemental du Bas-Rhin and by our friends from the Collège Gregoire de Tours. It takes place from Sunday, 14th May until Saturday, 20th May. It will be a rewarding experience for everyone to visit the European institutions in Strasbourg. 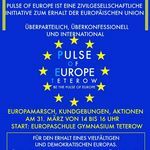 We are all in the final stages of preparing the next meeting in Teterow/Germany (March 26 - April 1). The different countries have to do some homework that we agreed on in Włocławek. It will be fun to evaluate and compare the different results. There will be lots of workshops and interesting excursions to Berlin and to the surroundings of Teterow. We are looking forward to seeing you all in Teterow. Dear friends, before the Christmas break starts we would like to wish you a peaceful Christmas and a good start in 2017. We are looking forward to the next couple of months. There are some highlights connected to our project especially the meetings in Germany and France. We hope you are successful and have some fun in preparing the next steps. The terrible events in Berlin and other places make our work even more important. It is the time to work and stay together, this is the main idea of our project. Although the world seems to be mad we should try to celebrate Christmas as a season of peace and hope. It was so good to see you again after the summer break. The meeting in Włocławek (13. – 19. November) was a big success in terms of results. But we also agreed on the schedule and tasks leading to the next meeting in Germany (26. March – 1. April 2017). The students will be working on advertising in different forms. It will be interesting to see and compare the products. We hope you enjoy dealing with this new topic. We are looking forward to welcoming you in Teterow. After having finished the first year of our project successfully we are ready to tackle the assignments for the second year. All the schools are preparing their tasks for the meeting in Poland in November. The students are busy writing and filming their profiles, finishing the survey about bullying and violence and designing the topic "Why I'm special". We are looking forward to meeting all our friends and colleagues again in Włocławek in November, 13 – 19.